Easter Vigil / Easter Sunday – the day everything has changed! Take some time to get into the week of holy celebrations. Each ceremony has much to teach us. Holy Saturday Vigil Readings – In this ceremony we wait in expectant hope. With symbols of fire and light, water and oil, the great celebration of victory over sin and death, being washed clean and joined to Christ and annointed to continue his saving mission unfolds as we celebrate and welcome new members into the body of Christ. 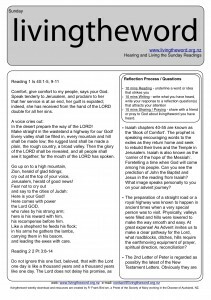 Download Easter Sunday – In this ceremony the Easter story begins to be told and shared. The meaning of Jesus rising from the dead and his message to his followers unfolds for the next 6 weeks of the Easter season. Acts chapter 10 is an very significant part of the New Testament. It is hard for us to understand just how big were the divisions between Jews and Non Jews (Gentiles). Jews were not allowed to enter a Gentile house and were certainly not allowed to ‘eat a meal together’. Acts 10 reveals the story of Peter entering a Gentile home and having a meal with a Gentile (and Roman Soldier!) Cornelius. Peter had a vision from God that the ʻgentilesʼ were ʻcleanʼ and could sit at table together with Jews. This message would upset many who had long held religious views of separation. What obstacle may God wish to remove within you so you can sit together with an ‘enemy’? Who do you consider ʻuncleanʼ? Before the Feast of the Passover Jewish women would spend hours sweeping and tidying their homes. They particularly got rid of any ʻleavenʼ (yeast to make the bread rise). It was a symbol of sin, capable of affecting the whole ʻloafʼ. In response to the Resurrection we are called to be ʻnewʼ, people of the light, walking out of darkness. What particular action, habit, area of my life will I seek to tidy and sweep during the season of Easter as a response to living the new life of the Resurrection? John’s gospel has Mary of Magdala, Simon Peter and the Beloved Disciple (John) – three foundational members of the early christian community – walking about confused. Belief in the Resurrection was not something that happened instantly. Even the ‘other disciple’ who saw burial cloths before Peter, had to look again before he believed. What has been your experience of Holy Thursday, Good Friday, Easter Saturday Vigil. What have you seen? What do you remember? What was shown to you by God to help you ‘believe’? Imagine someone you have loved in a very intimate and special way. This person died and you were personally involved in seeing the death, the burial. In grief you go to the place of burial and see first-hand that your friend is not there. There is evidence of burial cloths and a messenger that ʻhe has been raisedʼ and that your friend so wants to meet with you and you will see each other soon. What would be your thoughts and feelings? If the resurrection is true, what change in thinking happens about death? About life? About God?